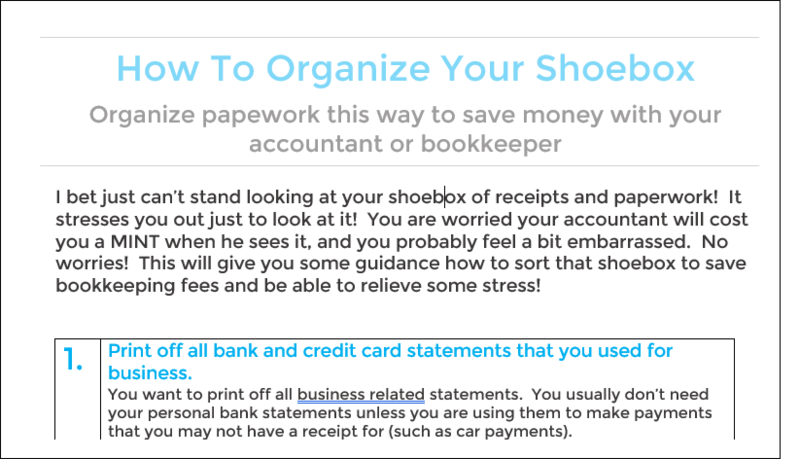 How to organize your shoebox in order to save money with your accounting professionals. Is that shoebox of receipts staring at you? Tax time is looming and you know you need to look after them! This cheat sheet will give you detailed instructions how to organize the cheat sheet so that you can save some money on bookkeeping and accounting fees. Get your PDF Checklist now! Simple instructions to help you be organized and stay organized before filing your taxes. This cheat sheet is only the first step. You will also get an invitation to take a course for FREE on your own time that will expand on the "how" to do this. This method works for the small guy/gal that is in business for themselves.